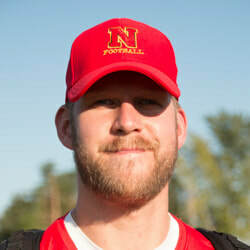 Coach Otterson came to Northglenn HS in 2014 and has coached both offensive and defensive lines since and was named the Offensive Coordinator in 2018. He was a 3 year starter on the OL at the Univ. of Wyoming, winning a bowl game in 2009. After college, Coach Otterson spent 2010 and 2011 seasons with the San Diego Chargers. Coach Otterson is a teacher at Northglenn HS.